Our Side drawstrings Maternity top stone is manufactured in stretchy knit viscose lycra. The side drawstrings allow you to adjust the length you feel most comfortable in. The side drawstring Maternity t shirt is cut in a flattering style. Makes a great costume cover up around the pool too, simply because of the adjustable length. The drawstrings go all the way up to the sleeve, giving options to gather where you want the bulk of the fabric. Short cap sleeve is perfect for those hot summer days. Our Side drawstrings Maternity top black is manufactured in stretchy knit viscose lycra. The side drawstrings allow you to adjust the length you feel most comfortable in. 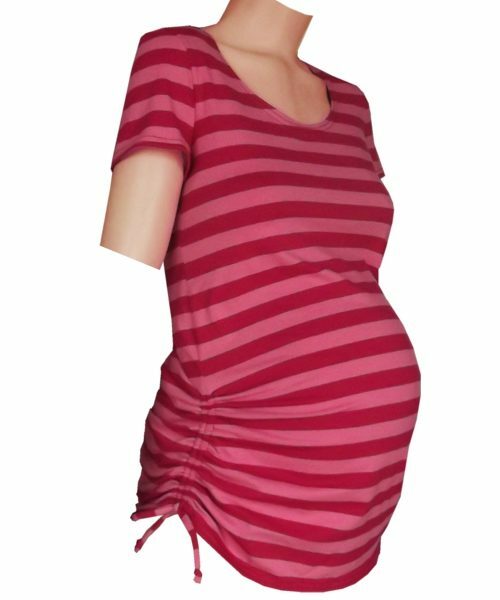 The side drawstring Maternity t shirt is cut in a flattering style. Makes a great costume cover up around the pool too, simply because of the adjustable length. The drawstrings go all the way up to the sleeve, giving options to gather where you want the bulk of the fabric. Short cap sleeve is perfect for those hot summer days.